Janine is really pleased to offer Baby Massage and Pregnancy massage for Mums and Mums (or Dads) -to-be. Janine is a Mum herself, and an experienced pregnancy massage therapist. Baby massage is offered as Individual one-to-one instruction and you will learn to do a full body massage on your baby and baby reflexology techniques. Baby massage will help to soothe and relax your baby and help you deal naturally with a number of conditions such as colic, constipation, teething, eczema and poor sleep patterns. To attend Baby Massage, babies should be at least 6-8 weeks old, have had their 6-8 week check and have no medical conditions where it would be inadvisable to massage such as infection, high temperature or a recent fracture. Babies can attend Baby Massage classes up to pre-toddling stage – however it is advisable to do it before they get too mobile at around 6 months. Please also make sure that 72 hours has passed after any immunisations. If your baby is 6 months – 18 months and you would like to learn about baby/infant massage, please do get in touch to discuss one-to-one sessions that are adapted to your needs. This is 2 sessions of 45 minutes over a two week period to teach you individually how to do a full body massage and reflexology routines on your baby. Babies need to follow the criteria above regarding age and health to receive massage. Please try to organise a time when you think your baby may be the most responsive to massage. The cost for the one-to-one tuition is £40 inclusive of full course materials, two 1-1 sessions, organic sunflower oil and post course support. To book a session please contact us to arrange a time. 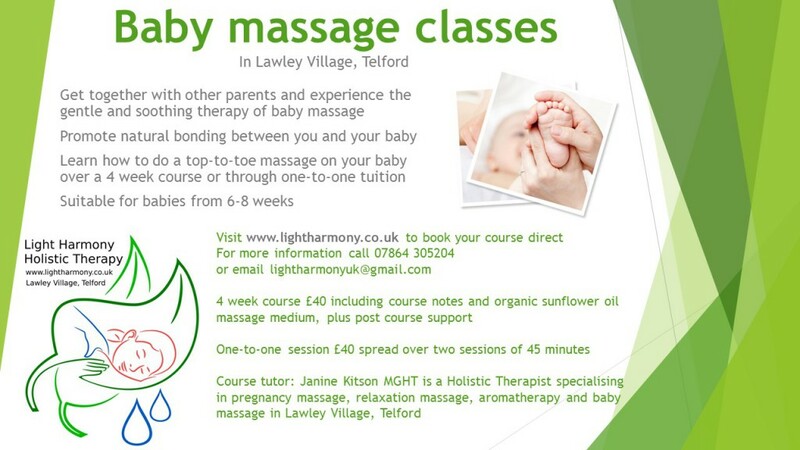 Baby massage is held at Light Harmony Holistic Therapy, Lawley, Telford. Janine practices in her family home, which provides a safe, warm, clean and welcoming environment. There is plenty of on-street parking.